SweetFeet builds on SkinFood’s nutrient-rich formula with a higher percentage of shea butter–nearly 40%! The addition of organic peppermint essential oil creates a scent reminiscent of mint chip ice cream, which makes SweetFeet a decadent (calorie free!) dessert for tired, dry, rough feet. Peppermint oil provides an aromatherapeutic benefit of energizing and rejuvenating, while also being mildly cooling. 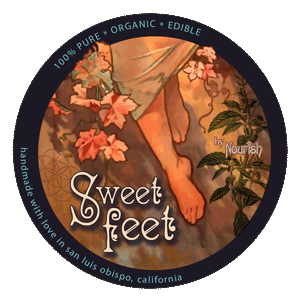 Trade callused and cracked feet for soft and smooth feet…sweet! goddess tip: SweetFeet’s extra-rich formula with added shea butter makes it a perfect choice for those areas in need of extra lovin’ like calluses, rough hands, cracked heels, split cuticles, and rough elbows. If your shins and knees get drier in the winter like mine, don’t stop at just your feet while spreading SweetFeet! There’s NO junk in this food!